These are the sausages we made the other week. 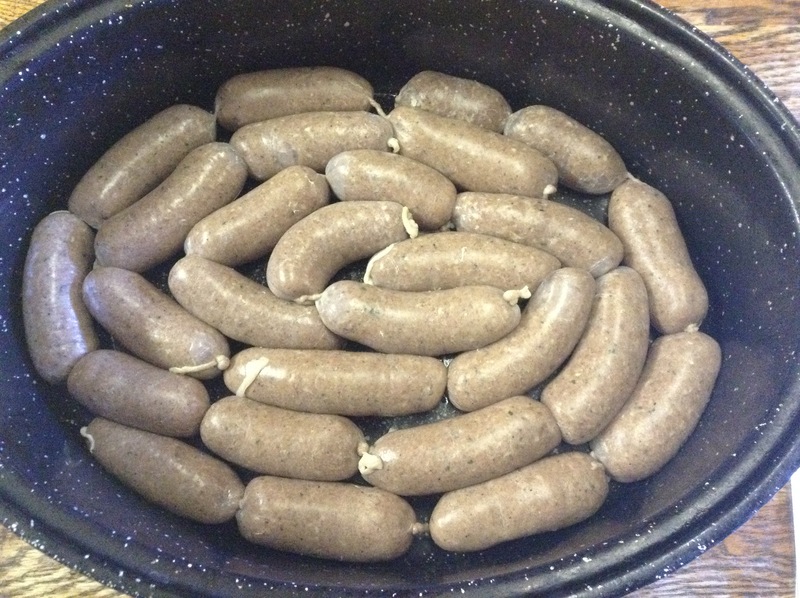 I completely spaced out taking a photograph of them after they’d cooked in the slow cooker with sauerkraut and apple. We took the dish to the tailgate and it was a BIG hit. Folks liked the concept of knowing what is actually in sausage! Combine salt, marjoram or oregano, garlic, black pepper, and mustard, and mix into duck and pork meat. “You can let this rest in the fridge for up to 2-3 hours.” Grind meat mixture through meat grinder “twice, first using the coarse die, then the fine one.” “If your room is warmer than 69 degrees, set the bowl for the ground meat into another bowl of ice to keep it cold.” “You can use a food processor in a pinch, but you will not get the fine texture.” Add wine and caraway seed to mixture, and mix thoroughly, “either using a Kitchenaid for low for 60-90 seconds or with your (very clean) hands. “This is important to get the sausage to bind properly. Return sausage mixture to fridge. Stuff sausage into casings all at once. Twist off links “by pinching the sausage down and twisting it, first in one direction and then with the next link, the other direction. Or you could tie them off with butcher’s string.” Hang sausages in a cool place for up to 8 hours, “the colder it is, the longer you can hang them.” Hang for 1 hour at room temperature, “and up to overnight if you have a place to hang the links where it is about 35 degrees.” Once sausages have dried “a bit,” refrigerate until needed. “They will keep for at least a week.” “If you are freezing the sausage, wait a day before doing so. This will tighten up the sausages and help them keep their shape in the deep-freeze.